By Cesar Diaz – NEW YORK, NY (Mar 23, 2012) US Soccer Players — Sunday’s home opener at Red Bull Arena was a complete success for the home side. After losing their first two matches to FC Dallas and Real Salt Lake by a combined score of 4-1, the Red Bulls finally showed their horns as Thierry Henry and former Portland Timbers forward Kenny Cooper each produced a two-goal performance. By winning their first match of their 2012 MLS campaign, the Red Bulls have given the South Ward a glimpse of how the season may turn out if they’re able to play their style of soccer. For those of you who are unfamiliar with the South Ward at Red Bull Arena, they’re the supporters clubs consisting of Empire Supporters Club (ESC), the Garden State Supporters (GSS) and the Viking Army. With the exception of the Viking Army, the ESC and the GSS has been supporter clubs of the Red Bulls dating back to the days since they were the MetroStars. The ESC was founded in 1995, the year before the first MLS season, while the GSS was formed ten years later. While the Viking Army is the youngest of all three supporters clubs in the South Ward, they’ve made their presence well known in short time. Originally formed by Benny Lopez, Kevin Webster, and Ralph Chupi Garcia in honor of Red Bulls manager Hans Backe, the Viking Army has been in existence since 2010. Over the past two seasons, I’ve gotten to know Benny, Kevin, Chupi and their ever-growing membership. A few weeks ago, I had approached them about the possibility of attending one their tifo-making sessions for the home opener. Not only were they keen about the idea, they had also invited me to watch the Red Bulls at the Viking Army's regular spot, Catas in Harrison, New Jersey while they began worked on their tifo display. Taking the New Jersey Path from Manhattan, I got off at the Harrison Station. To be honest, if it wasn’t for Red Bull Arena itself and a helped wanted sign for parking attendant on game day, I would not have known that professional soccer is played in the Harrison area. Once in Catas, there was no doubt about the loyalty to the local soccer club. 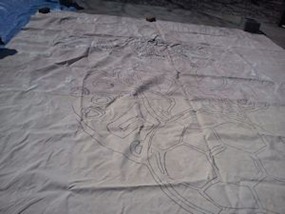 As Viking members arrived in numbers with paint and brushes and opened their canvas, I saw the outline of what they were now going to color in. Basically, it looked like a coloring book for the Green Giant. If I learned anything about tifo-designing is that it’s expensive. Based on the gallons of paint alone, that more than justifies any membership fee any supporters club has. In addition, you need artists and volunteers who have no reservations about making a trip to get paint over their clothes. While the painting was going on, I asked Kevin to provide a clean and clear answer to the Viking Army’s mission as they enter their third year of existence. While some of the Viking Army members painted away, Benny Lopez introduced me to former MetroStars player Rob Johnson. As a surprise guest, Johnson was officially a Viking Army member after Benny had him recite their Viking oath. Following that, he was given a supporters club scarf and membership card. A product of New Jersey, Johnson is still involved in the New Jersey area coaching youth soccer. Despite the 2-0 loss to FC Dallas, the Viking Army still had a good time and was very much optimistic about the MLS season. They're a supporters club that wants to stress their ties to the city their team plays in, representing Harrison and the New York Red Bulls. The Viking Army was part of the South Ward Challenge this past Saturday at the Harrison Courts. They reached the championship game before ultimately falling 2-1 to the eventual two-time champions, the Empire Supporters Club. The next day, it was time to display their first tifo of the 2012 season. More will follow, as the supporters clubs try to build the link between community and professional soccer. Cesar Diaz is a freelance writer for several online soccer publications. If there's a soccer topic you believe needs to be written about, please feel free to contact him. Easily approachable, you may contact him at CoveringSoccer@gmail.com and @CesarDiazNYC.